A hot day, but a great day to see what electric cars can do! We enjoyed visiting, sharing, showing off our cars, admiring other folks cars and, most of all, learning! We saw lots of local people and had visitors from over 100 miles away: 140 in total attended! Some of the cars were fully electric, some were plug-in hybrids. We had 2 car dealers providing cars including brand-new plug-ins. We volunteer brought his conversion car: a vintage VW bug, which is now on it's second conversion (Release 2.0), to lithium ion batteries. We are already looking forward to next year's event. See you there! The NDEW event in Carlyle, IL at the Case-Halstead Public Library on Saturday September 15th from 10 AM to 1 PM, was a great success! 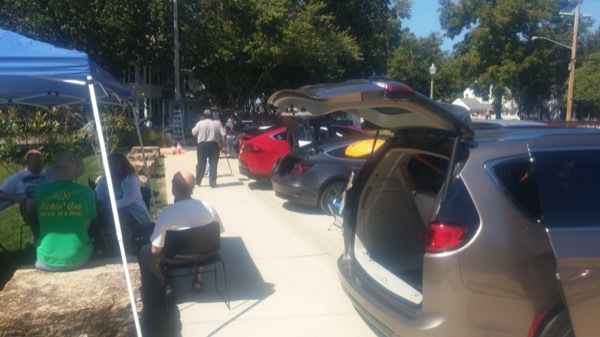 We had 14 plug-in vehicles, including a vintage VW "beetle", several Tesla's, a Chevy Volt and Chevy Bolt EV, a Toyota Prius Prime, a Chrysler Pacifica Hybrid, and a Nissan Leaf. The Library unveiled the site of its new Level 2 electric car charging station. A good time was had by 140 attendees and we are already planning for next year's event. Let's Meet to See and Learn About Electric Vehicles, Saturday, September 15th, from 10 A.M. until 1 P.M. at the Case-Halstead Public Library 571 Franklin St. in Carlyle, IL. We will have car demonstrations and answer questions. There will be access to the Library, restrooms and simple refreshments including water and soft drinks. There is a lot going on in Carlyle and this is the weekend of the Carlyle City-Wide Garage Sale and there will be a used book sale at the Library that day. If you have a plug-in vehicle, please register it to display and answer questions about your car. (There should be 110V outlets available for charging, so bring your portable charger if you would like to plug-in!) Afterwards people may choose to cruise their cars past the lake and meet at a local restaurant for lunch. Registered attendees report 370,611 electric miles driven.